When Lilly’s opened on Abbot Kinney in 1999, it was one of only two restaurants on the block. 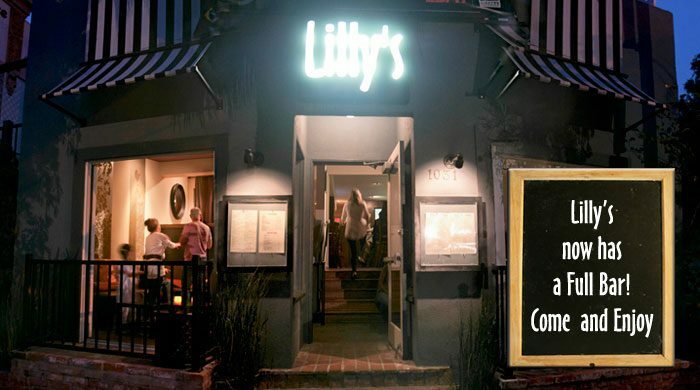 Now, Abbot Kinney is an iconic restaurant destination and Lilly’s remains one of the most popular places in the area. With a recent interior redo and the addition of a Bar Menu and extended Bar seating area, this bastion of French comfort food by Chef Francis Bey, is busy throughout the day. The charming setting includes the bar and bar Lounge area, dining room and gorgeous garden patio. Lunch is served from Noon until 2:30pm Monday through Saturday and offers a $12 lunch special menu daily in addition to the regular menu. Happy Hour is 7 days from from 5:30pm until 7:30pm with a terrific Bar menu offering one of the best little burgers in town. Dinner is served nightly from 6pm until 10:00pm and 10:30 on Friday and Saturday. Sunday Brunch begins at 11am until 2:30pm with a special $12 Brunch special menu and the regular menu being offered. This is where the locals come to feel at home and people travel just for the Moules Frites. Lilly’s remains au current and a constant in a frequently changing restaurant scene. Comforting, just like the food. Copyright © 2019 Lillys French Cafe. Restaurant And Cafe by Rara Theme. Powered by WordPress.